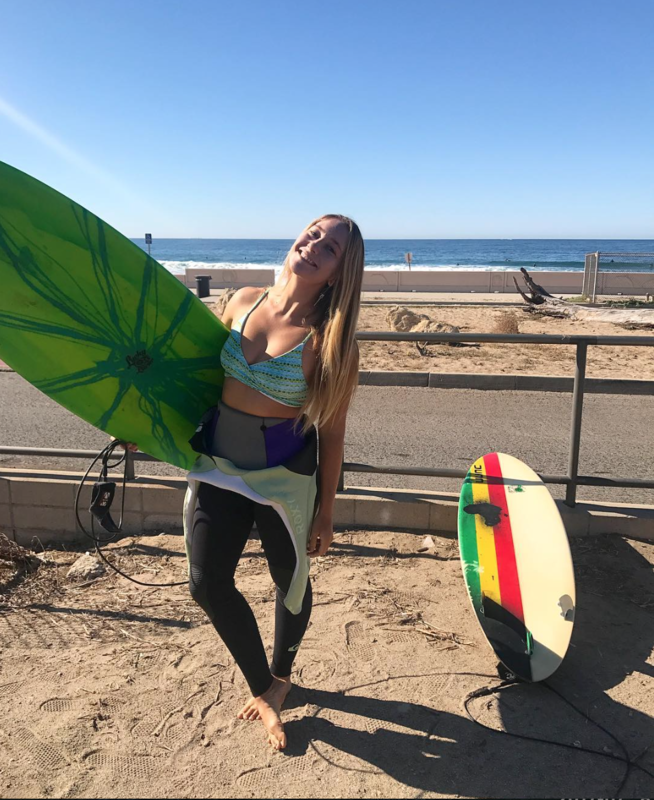 Co-Founder of World-Class Surf Trips, global adventurer, yogi, climber, surfer and environmentalist, Nadia Redel is making an impact around the globe, one awesome experience at a time. Her company does more than create incredible surf experiences, they also promote sustainable travel, products, and lifestyle choices. Nadia and the company she has built are a true inspiration to us, so naturally we had to get in touch. We got a chance to speak to Nadia in between adventures. Enjoy. I was born in Berkshire County in Massachusetts. It was great to grow up in the country, surrounded by nature, yoga and good small town vibes. I grew up with a close connection to nature. When were you first introduced to your passions of surfing, climbing, yoga, and other adventure based activities? My passion for adventure started at a young age. My parents really encouraged traveling which introduced me to many different types of activities including yoga, cliff jumping, free diving, rock climbing etc. It wasn't until my early 20’s when I met Mac ( co-founder of World-Class Surf Trips) that I found my love for surfing. What makes Nadia tick? What are some of the things that motivate you to wake up and charge the day? Someone once told me, “If you’re not progressing, you are degressing.” That idea gets me out of bed every day. I apply that to every aspect of my life including work, health, fitness and my own impact on the environment. What are some of your most creative experiences that you have had, personally? When I was a kid, I was part of a creative problem solving team called D.I. It was really fun and it encouraged me to solve a problem from a unique perspective. One of my most creative experiences has been starting a travel company. Every day it is different and it has been a fun journey shaping and changing World-Class Surf Trips as it grows. What do you enjoy doing when nobody's watching and you are alone or with friends? I’m the biggest goofball in the water, especially when it’s my core group with me. I’m always singing, trying handstands on my board and dancing down the waves. Life shouldn't be too serious. If you could have advice for the youth of the world today, what would it be? My advice for the youth would be to look at the world through an environmental lens. In order to achieve any amount of success, the world we live in needs to be healthy. It is important that the environment is a part of every single decision that we collectively make. What is your relationship with nature, the environment and organizations that are fighting for a better tomorrow? I have always had a high level of respect for nature. Growing up in the country gave me a unique understanding for the wilderness and a feeling of home among the sublime. I have volunteered for many organizations in the past that benefit the environment. Two projects that are close to my heart right now are Vatuvara Foundations, that helps protect the marine ecosystems within the Fijian waters and the International Anti-Poaching Foundation led by ex navy seal Damien Mander. The ocean is a place that resonates with me. I feel truly at home in the water. I love holding my breath and swimming down deep among the fish and marine animals. It is at this depth that time seems to stand still. It is this connection that makes me so passionate about marine conservation. Within the Environment, what is a primary focus for you? Is there a specific malady that you resonate with the most? One of my biggest passions is to limit the use of plastic. This can be very challenging and at times might seem impossible, however if everyone tries to make a conscious effort to reduce, reuse and recycle we can limit the amount of plastic waste on our planet. I’ve been very fortunate to travel a lot and it always saddens me when I visit a remote location and find plastic waste littering the coast and land. It is no secret that we have an environmental crisis. So many different issues to focus on, which can be crippling to people. What advice do you have for people anxious for a better tomorrow, but overwhelmed by the vastness of the problem? Don’t feel like YOU need to fix ALL the problems. Find something that inspires you, and then become passionate about it. We need to all keep living our lives, but we can do this through an environmental lens. It might start as small changes, but even these make big differences. The best way to feel inspired is to spend more time outside! We encourage you all to follow @worldclass.surftrips or checkout www.worldclasssurftrips.com to plan your next adventure!